The easiest solution is of course to put fig trees in open ground. They are healthy and fast-growing trees that barely have any problems. The Dutch soil, where the water table is too high, will do just fine. Moreover, it is easier because the figs require much less watering than when they are in a jar. Some stones for drainage and a little lime in the soil promotes the growth of the fig. Fig trees will grow very quickly in the ground and as a result they get thin long shoots that will easily freeze in the winter, when they are outside. This can be prevented by the fig plant in poor soil and have little space to shoot many roots. This can be done by, for example, or placing them next to a wall, or to put in a buried tank, or to be placed on a bed of stones in the ground. It is important to prune these trees will you get a nice tree. 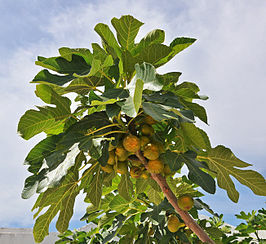 A fig tree is strong and can be pruned without real risk. Spring is the best time to prune. The reason is that during this period the sap flows are less related to the cold. This allows the tree can not bleed to death. A short trimmer is ideal if you prune a fig tree. Bekijk onze voedings- en beschermingsproducten Gratis verzending naar adressen in Nederland vanaf 50 euro en alles wordt binnen 24 uur verzonden!